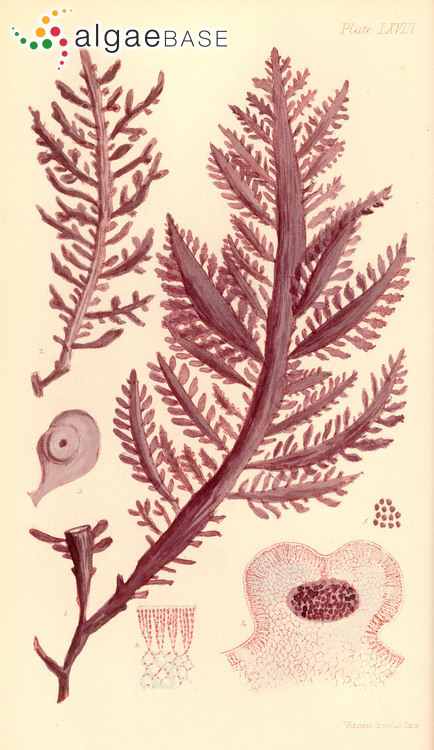 Papenfuss (1964: 41) consdiers that the Auckland Islands record (Rabenhorst, 1878: 41) is probably based on a misidentification. In deep water on rough-water coasts (Edyvane & Womersley 1994: 314). Type locality: Port Philip, Victoria (Edyvane & Womersley 1994: 314). Holotype: Herb. Agardh, LD 23536 (Edyvane & Womersley 1994: 314). Notes: Misit Malm. Australia and New Zealand: Auckland Islands (Papenfuss 1964), South Australia (Edyvane & Womersley 1994), Tasmania (Edyvane & Womersley 1994, Scott 2017), Victoria (Edyvane & Womersley 1994).